It is perhaps convenient for us as Americans to believe that our struggle for independence in the latter half of the 18th century was solely due to the efforts of like-minded volunteer militia and well-heeled gentry of the original 13 colonies. The legends of men like Paul Revere and Daniel Morgan have rolled down to us as examples of independent-minded, patriotic heroes standing toe-to-toe with the world’s greatest superpower. But while it can be said without a doubt that the victory of independence was largely due to the collective decisions and actions of the militias, regular army, and representative leadership, it is an incomplete picture. Given recent political antagonisms it might be unpopular to advance this point; however, it would be wrong to forget the contributions- economic, strategic, and physical- that the French made towards our victory. In fact, the French played a critical, if not the critical role in helping push George III’s court to accepting terms of independence. As is typical within historical circumstances, this story is best told within the confines of a single person’s experience. In this case, the story of Marie Joseph Paul Yves Roche Gilbert du Motier, the legendary Marquis de Lafayette. You can find his name in every major American city- street names, national and state parks, public buildings, statues, and even city names themselves. The greatest of foreign-born soldiers in the Continental Army was a man George Washington himself held in the very highest esteem. 50 years after the founding of the United States, Lafayette made a return tour of the country for which he gave so much as a youth. He was met with throngs of adoring Americans wherever he traveled. Crowds cried out his name and even fought just to get a glimpse of a man that they felt was a hero of their recent Revolution. Yet most Americans have no idea who this man was, let alone the enormous contribution he made to our country’s fight for independence.Whether the Colonies would have had the necessary strength to implement the Declaration of Independence, let alone win the War, without the aid of France is a question we do not seriously consider in modern-day history classes. Certainly the leaders of the Continental Congress realized the importance of French assistance and began to seek out such help soon after the outbreak of the American Revolution. In the fall of 1775, the Congress appointed a Secret Committee of Foreign Correspondence. Early the next year the committee decided to send an agent to France to seek the aid of that Nation in the struggle against Great Britain. Silas Deane was selected for the task. Within a few months after his arrival in France, Deane, covertly aided by the French Government, obtained and sent to America clothing and arms in large quantities. 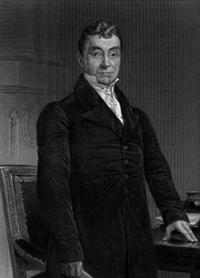 At the suggestion of Deane, the Compte de Vergennes, French Minister of Foreign Affairs, obtained permission to lend America money. Until 1778, France continued to give America all aid short of actual military support. Lafayette had heard about, and became sympathetic towards, the romantic American cause, which to him represented an opportunity not only to distinguish himself, but also to pursue what he deemed a truly noble cause. He made the passage to America, after seeking and gaining assurances by the American ambassador, Silas Deane, that he would receive a commission as major generals in the Continental Army. He arrived in Charleston, South Carolina, in June, 1777, and traveled to Philadelphia to meet with members of Congress who welcomed him enthusiastically as he announced that he would serve without pay as a volunteer. In August he met General Washington and a friendship developed between the two men which lasted throughout the remainder of Washington’s life. He spent the winter of 1777 at Valley Forge with the rest of the army. It was there that Lafayette first demonstrated his value to the army in general, and to Washington in particular. It was at Valley Forge where several of Washington’s subordinate officers conspired against Washington to have Congress relieve him of overall command. However, they were unable to gain the support they expected. They tried to secure the cooperation of Lafayette, as well as Alexander Hamilton, but both men declined. Washington found Lafayette to be not only a loyal officer, but a devoted friend as well. Washington’s confidence in the young Frenchmen was proven correct at the Battle of Monmouth. The command of the force entrusted with the attack against the British general Clinton was assigned to Charles Lee, Lee having the highest officer rank next to Washington himself. Lafayette commanded one of Lee’s divisions. Monmouth is famous for the high degree of disorder during the American’s retreat from the field (Lee was later chastised strongly by Washington for his unwillingness to engage the enemy). It was Lafayette who sent a messenger to Washington urging him to come to the filed himself. During the remainder of the battle, Lafayette commanded the second line of infantry. In early 1778 Washington sent General John Sullivan to Newport, Rhode Island, where the British had fortified a strong defensive position. Sullivan was to later combine his forces with supporting troops from Nathaneal Greene Lafayette, as well as a highly anticipated French force. The Americans hoped that the French forces would provide the badly needed strategic tipping point required to defeat the British. Unfortunately the French fleet suffered serious damages during the voyage to Newport, and retired to Boston for repairs. Lafayette was ordered to Boston to urge the French to get back underway as soon as possible. Traveling back to Newport, with little rest, Lafayette found that the British had taken the initiative and attacked Sullivan’s forces, and the Americans were retreating to higher ground. 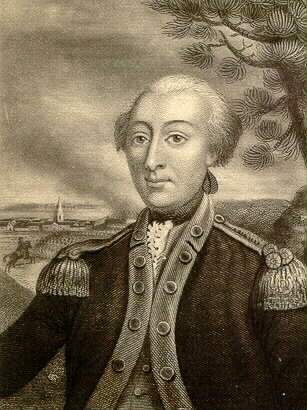 Lafayette immediately went to Sullivan and requested that he be given command of Sullivan’s reserve forces. Sullivan agreed, and Lafayette brought the reserve forces to the front lines to combine with the main force, which subsequently forced the British to withdraw. In his subsequent report to Congress, Sullivan noted Lafayette’s skills, whereupon on September 9, 1778, Congress passed a resolve formally thanking Lafayette for his commitment to the Revolutionary cause. Soon thereafter, Lafayette returned to France where he received accolades from the French court for his devotion to the American cause. But Lafayette’s service to America was just beginning. Lafayette made numerous formal and informal efforts to secure additional aid from his government for the colonists. In June of 1779 Lafayette wrote Washington and expressed his desire to back with the army again. In 1780 Lafayette’s efforts (among others, to be sure) resulted in the deployment of French troops and supplies to America. So insistent was Lafayette for aid to the Americans that one day the Minister of Finance said in the royal council: “It is fortunate for the King, that Lafayette does not take it into his head to strip Versailles of its furniture, to send to his dear Americans; as his Majesty would be unable to refuse it.” The King appointed Jean-Baptiste-Donatien de Vimeur, the Count de Rochambeau, as overall commander of the force’s twelve battalions of infantry, with Lafayette to take command of the American division serving directly under Washington’s command. Upon his return to France, Lafayette was hailed as a hero on both sides of the Atlantic. In 1782, he was promoted to the rank of marechal-de-camp (major general) in the French Army by Louis XVI. During the following 20 years, he aided the American government on numerous Franco-American political and economic issues. He also threw himself completely behind the questions of reform in his homeland. He was one of the first Frenchmen to advocate a National Assembly, and supported the establishment of a constitutional monarchy. He favored many radical positions for France such as the abolishment of formal titles, instituting trial by jury, religious freedom, and political rights for blacks. 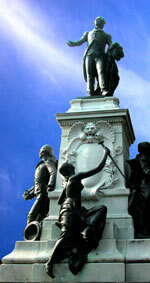 By the late 1780′s, Lafayette became one of the most popular and powerful men in France. On the first anniversary of the capture of the Bastille, Lafayette himself administered the oath of loyalty to “the nation, the law, and the king” to a large assembly of troops and sailors. But, being a fierce independent thinker, eventually he was attacked by both sides of the French political spectrum. Lafayette himself rescued Queen Marie Antoinette from the mob that stormed the Palace of Versailles on October 5, 1789. In 1790 Lafayette was promoted to Lieutenant General in the French army, but resigned shortly thereafter. When war against Britain broke out in 1792, he prepared troops for war, winning the confidence of his men by, among other things, organizing mounted artillery. Against his wishes, he was ordered to move his troops to what is now Belgium even though they were not prepared. As Jacobin radicalists gained favor in Paris, he was unable to help his king and queen and bring his troops home to deal with the mobs now roaming Paris, and was summarily declared a traitor. He fled to Belgium with members of his immediate staff, but was arrested by the Austrians, who in turn surrendered him to the Prussians. For five years he remained in jail, despite English and American political pressure aimed at his release. Finally the Austrians turned him over to the U.S. consul in Hamburg. He returned to Paris in 1800, his family fortune all but gone. He then turned his attentions to La Grange, his home just outside of Paris, where he apparently settled into a quiet agrarian life, the only major interruption being his refusing allegiance to Bonaparte himself during a visit Napoleon made to Lafayette’s home. In 1818, after three years of seclusion at home, he was elected to the chamber of deputies, where he sat till 1824, as a leader of the opposition, opposing the censorship of the press, and voting for various liberal measures. In 1824 President Monroe invited Lafayette to visit the United States. He arrived in New York, and was warmly greeted by virtually everyone he met. In the course of the next fourteen months he traveled through the whole country, visiting each of the 24 states and all the main cities. In consideration of his services in the Revolutionary war, Congress voted him a grant of $200,000, and a Florida township of 24,000 acres. His sixty-eighth birthday (September 6th, 1825) was celebrated at the White House with then President John Quincy Adams. He was the last surviving major general of the War of Independence. Returning once again to France, Lafayette was retired until, at 73, he led an opposition movement to new restrictions on citizens’ rights. In 1830 he took part in his third revolution- he was offered command of the Army of National Guards that drove Charles X from France, but declined the popular demand that he be named president of a new republic. Instead, he supported the ascension of Louis Philippe to the throne. He remained a member of the chamber of deputies until his death. It is interesting to note that Lafayette was truly unique among his French political peers; he refused to cooperate with the Bourbons, the Jacobins or with Bonaparte himself; and all three sides tried to discredit him for many years. Yet his support from the populace, although inconsistent at times, remained substantial throughout his adult life. Lafayette died in Paris on May 20, 1834. When news of his death reached America, Congress ordered the Liberty Bell muffled. He received a huge state funeral, and his remains were interred beside those of his wife in the cemetery of Picpus in Saint-Antoine. He left one son, George Washington, and two daughters. Lafayette left a journal, which was published along with various ancillary materials (including letters to and from Washington) by his son George under the title “Memoires, manuscrits et correspondance du General de Lafayette ” (6 volumes, 1837-’38). See also Lafayette by Harlow Giles Unger; The New Cambridge Modern History: Volume 8, The American and French Revolutions 1763-93 (The New Cambridge Modern History by A. Goodwin; General and Madame de Lafayette: Partners in Liberty’s Cause in the American and French Revolutions by Jason Lane.